Introducing the 2017 Skills International EU Project Manager. 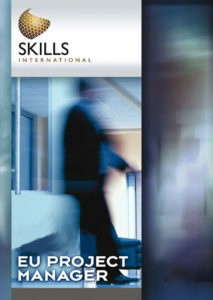 Our most advanced EU Project Management Training. Project Management is the discipline of planning, organizing and managing resources to bring about the successful completion of your project’s goals and objectives. Experienced managers understand the importance of optimizing assets while taking advantage of core European Union and international programmes. Skills International will be there to help you with the financial administration of your project, to prepare for audits and train your staff. The EU Project Management Training comes onsite in various countries, staff training co-financed by Erasmus+, online, personal webinars or as a combined blended learning course.